The ASV is open for business and Green Witch's house is proving to be a popular rental with some visitors returning for their fourth and fifth times. It is a single-storey house designed on a split basis, ie the two main bedrooms are at opposite ends of the house, separated by the main living area. This makes it especially suitable for two couples to share. The house is comfortably furnished with a well-fitted kitchen with large fridge/freezer, cooker, microwave, dishwasher, washing machine and drier. There is a breakfast area where you can watch the sunrise while eating. The living area is a large, open and spacious area comfortably furnished and attractively decorated to provide a pleasant place to relax and eat. 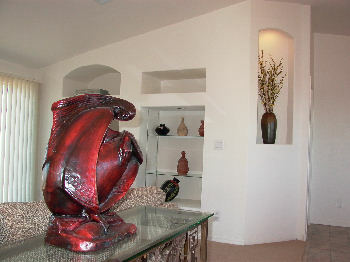 The lounge area faces the canyon and two large picture windows give super views of Cave Creek Canyon and the mountains. They also give access to decking where you can sit and watch the sun go down. The dining area faces away from the canyon and enjoys the early morning sun. 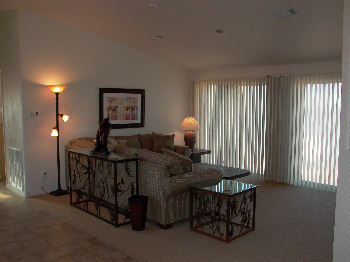 TV, video and DVD players are provided for those times when you want to relax indoors or catch up on the world outside. The master bedroom has a double bed and en suite bathroom with corner bath and separate shower. Built-in wardrobes and cupboards provide plenty of hanging and storage space. 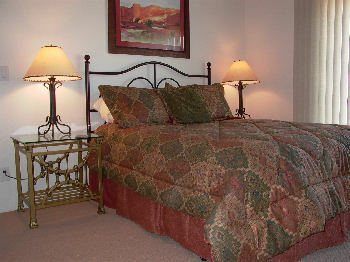 The second bedroom has twin beds and is adjacent to the family bathroom and study. It is separated from the master bedroom by the living area so two couples can share the house and each have their own bathroom and privacy. 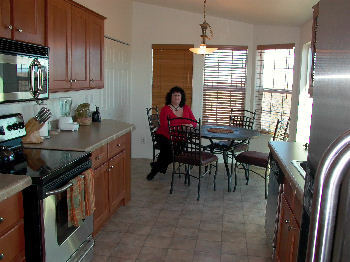 Both bedrooms have large picture windows looking out on Cave Creek Canyon. 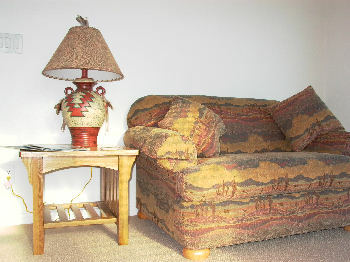 One of the sofas in the living area opens to provide a comfortable double bed. 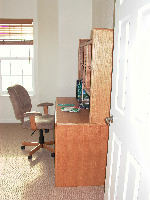 The smaller sofa in the study (shown here) also opens to provide a comfortable single bed. Thus the total sleeping accommodation is for seven people. We prefer to restrict the number to four but will consider larger parties in some circumstances. The basic price for the house is $125 per night which includes all utilities, towels and bed linen for up to two people. The price for up to four people is $135. Please note that these prices are for the whole house, not per person.